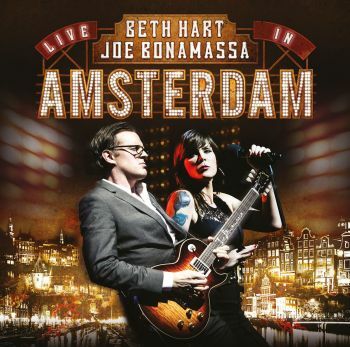 BETH HART/ JOE BONAMASSA - LIVE IN AMSTERDAM VINYL (3LP) | Online Shop | Wizard LTD. Album: "LIVE IN AMSTERDAM VINYL (3LP)"
Live In Amsterdam is the 3LP, 2CD, 2DVD and Blu-ray release of the highly talented duo Beth Hart & Joe Bonamassa. After two successful collaborations with 2012 “Don’t Explain” and 2013 “Seesaw” Beth Hart & Joe Bonamassa decided to tour for the first time. The duo did a very short exclusive run in prestigious venues, ending the tour with 2 sold out shows in the historic Carre Theater in Amsterdam. This beautiful location was where Beth Hart, known for her raw and powerful blues-rock sound, amazed everyone with a spectacular performance. That inspiring performance was captured on film and has been released on 3LP, 2CD, 2DVD and Blu-ray on March 24.